Author David Vann conveys the elemental landscape of the Alaskan wilderness as a metaphor for recent retirees Irene and Gary and their unraveling marriage in his heartbreaking novel Caribou Island. If this were a meal, it would be a gourmet treasure, a palette of colors, textures and ingredients so unusual as to make the diner gasp at its unique nature. However, the hopelessness of the protagonists’ lives makes it almost impossible to take more than small bites of this tome. Irene’s headaches and melancholy are rendered to make the reader feel the pain and the depression as she experiences it. As a reader I found it arduous to dwell in Irene’s maladies when I wanted to scream at her to get away from her narcissist husband. Gary’s obsession with building a cabin without plans or elementary skills when he knew that Irene hated the island and its isolation was unpleasant to read and he seemed too insensitive to be real. Their daughter, Rhoda, sees her mother’s descent as a problem and she tries to help but she has her own demons. She’s lived with her wealthy boyfriend for a year and they have a future but Jim is exhibiting much of the same lack of empathy for her life as her father shows her mother. The minor characters add a Stephen King aspect to the novel contributing even more to the disquieting atmosphere. When visitor Monique seduces Jim, the writing sizzles and evokes a scene as visual as one by Tennessee Williams and with some of his same psychological intrigue. Readers will need strong stomachs for dysfunction and misery to tolerate the despondency and enjoy the beauty of the writing. David Vann is clearly an adept novelist with breathtaking talent. This novel deserves five stars for the luminous writing but I can only grant it three for readability. Vann clearly prepares the reader for the stark conclusion and for the manner in which the sins of the past visit future generations but for me that still didn't make it easy enough to accept. Vann writes: "Those who couldn't fit anywhere else came here, and if they couldn't cling to anything here, they just fell off the edge." As a reader, I fell off the edge while reading this novel. Usually I’m grateful for a novel capturing me so fully but I just couldn’t swallow that much tragedy in one book. Summing it up: Read this dark, morose novel about a dysfunctional couple who set off to build a cabin on a remote island in Alaska coupled with the story of the effect of their lives on their adult children for the writing but know that it’ll be disheartening. In Jacqueline Winspear's early novels, Maisie Dobbs was a perceptive, plucky and competent investigator sensitive to shell shock’s damage and the unseen aftereffects of war. In A Lesson in Secrets, set in 1932, Maisie seems to be juggling too many mysteries and relationships to do justice to all of them. 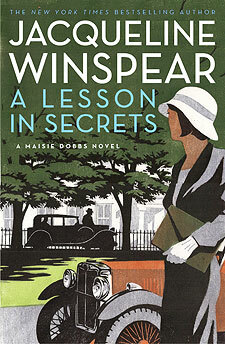 Maisie Dobbs, a truly unique character, first appeared in 2003 to much acclaim. In this the eighth entry in the series, Maisie’s boyfriend James is in Canada on business leaving her confused but with time for new endeavors. She has a new secretary with a mystery of her own. But the main thrust of the novel is Maisie’s acceptance of an undercover assignment overseen by both Scotland Yard and the Special Service that has her teaching at a Cambridge college devoted to promoting peace where some of the college’s non-British professors may be leaning toward the burgeoning Nazi party. When the college’s controversial founder and a famed pacifist author of children’s books is murdered and his secretary disappears, Maisie tussles with the Secret Service as she tries to catch the murderer. The novel is at its best in describing the attraction of the Nazi Party to Britain’s upper classes. But too many subplots and unnecessary coincidences make the rushed ending less satisfying than the earlier titles. Summing it up: Start with Maisie Dobbs and Birds of a Feather then wend your way through all eight Maisie mysteries including A Lesson in Secrets. The last installment doesn’t live up to the early novels but it’s still an enjoyable escape. 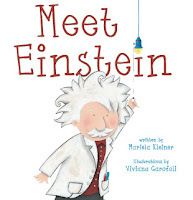 Summing it up: I absolutely adore this ode to light, gravity and science that made me run in search of preschoolers so I could share its color-filled illustrations and excitement. 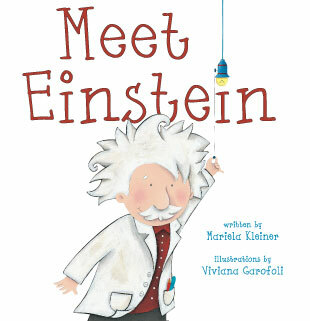 Children will beg to read this charming concept book.